(a) Calculate the impedance Z of an infinite chain of elements with impedances Z1 and Z2, as shown in the top figure. (b) Calculate Z1 and Z2 for the specific case shown in the bottom figure. We treat the circuit as an infinite ladder network with characteristic impedance Z0. Since the ladder is infinite, the impedance Z will not change if an additional section is added to the front of ladder. 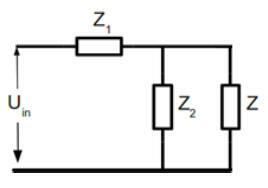 (a) An equivalent network with impedance Z is shown in the figure. Z = Z1 + ZZ2/(Z + Z2), Z2 - Z1Z - Z1Z2 = 0, Z = Z½ + (Z12/4 + Z1 Z2)½.
Z1 = iωL - i/(ωC) = (i/(ωC))(ω2LC - 1), Z2 = (-iωL)/(ω2LC - 1). Z12 = (-1/(ωC)2)(ω2LC - 1)2, Z1 Z2 = L/C. Consider the "twin-T" band-pass filter as shown below. Find the highest and lowest frequency passed by this filter if it is properly terminated. 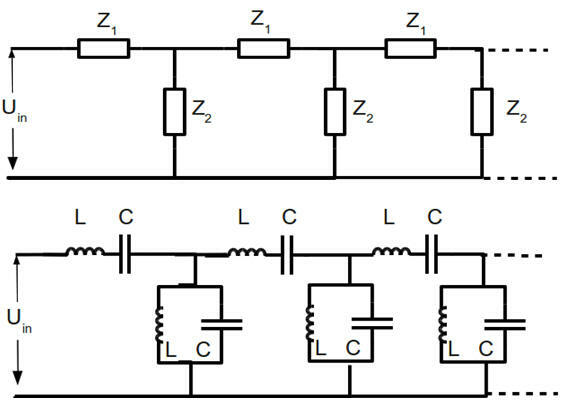 In order to act as a filter, the circuit must be terminated with the characteristic impedance Z0 of the ladder network. Z0 = (Z12/4 + Z1Z2)½ if the sections of the ladder look as shown below. If Z02 > 0 the frequency is passed. Z0 = (Z12/4 + Z1Z2)½.
Z1 = iωL + 1/(iωC), Z2 = 1/(iωC'). Z12 = -ω2L2 - 1/(ω2C2) + 2L/C. Z1Z2 = L/C' - 1/(ω2C'C). = (LC'+2LC)/(2CC') - ω2L2/4 - (¼ + C/C')/(ω2C2). Set Z02 = 0, then ω2(LC'+2LC)/(2CC') - ω4L2/4 - (¼ + C/C')/C2 = 0. Quadratic equation in ω2: ω2 = 1/(LC) +2/(LC') ± 2/(LC'). If ω ≈ 0, Z02 < 0 the frequency is not passed. If ω --> ∞,Z02 < 0 the frequency is not passed. Frequencies between ωmin2 = 1/(LC) and ωmax2 = 1/LC + 4/(LC') are not filtered out.